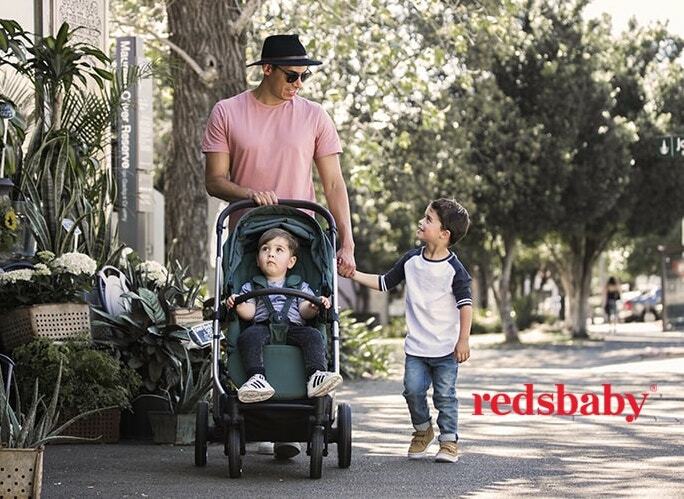 One Fine Baby Sydney SPECIAL OFFER: Bugaboo loves you with 15% off + Visit Bugaboo and scan your entry ticket to go into the draw to win a Bugaboo Fox pram valued at $1799. One Fine Baby Sydney SPECIAL OFFER: FREE buggy board (RRP $199.00) with any Surf pram purchase. With contemporary looks, luxury styling, multi-terrain handling and a bonus sport wheel to switch from three to four wheels, The Special Edition Surf Henley is more than just looks. Featuring rich inky navy fabrics and a gloss graphite chassis, a compact fold and air-ride suspension to give your baby the smoothest of rides – once you’ve pushed it, you’ll see why there is no other pram like it. Add the buggy board so an older sibling can ride along – the perfect compact and practical pram for mum and dads on the go! The name Silver Cross has long been associated with royalty, first supplying a pram for King George VI. The Queen and Duchess of Cambridge Kate Middleton have both used Silver Cross prams for their children. Micralite is a pram designed to help parents get out there, go anywhere, who love to travel and enjoy a fun lifestyle. The TwoFold travel system is in a category all of its own, it effortlessly converts from single to double in a matter of seconds with multiple usage modes as well as a built-in ride on buggy board. The revolutionary all-terrain FastFold is perfect for Australian lifestyles and can be taken on the beach, use from 6 months+. It features a unique ultra comfortable and ventilated hammock seat, with recline option. SmartFold is engineered for effortless everyday use, featuring premium fabrics and detailed finishing. Add our beautiful Air Flo Carry Cot for use from birth. We’re proud that Micralite won the ‘Best in Show’ for the 2018 New York Baby Show. One Fine Baby Sydney Special Offer: Free Carrycot with SmartFold and TwoFold – RRP $350.00. One Fine Baby Sydney SPECIAL OFFER: WIN A REDSBABY LIMITED EDITION JIVE² CARBON VALUED AT $999 . Visit the Redsbaby stand and scan your entry ticket to go into the draw to win a limited edition JIVE² Carbon. Otto is a new lightweight stroller designed by Edwards & Co. Take him on the train or plane – and you’ll love him at the other end! This super-smart all-rounder is designed for comfort… designed for ease… and designed with love. Edwards & Co are a boutique, family-owned company made up entirely of parents based in New Zealand. They are designers, who are precise and uncompromising – focused on creating products with a style, finish and quality that is second to none. One Fine Baby Sydney SPECIAL OFFER: Purchase any Otto at the show and receive a complimentary free travel bag + UPF 50+ sun cover, plus you could WIN an Otto when you scan at the Edwards & Co stand. One Fine Baby Sydney SPECIAL OFFER: $150 OFF AMAZING ICANDY MI-CHAIR and visit the team for exceptional deals on all models. Note// To redeem any of the offers mentioned above you must register HERE for your tickets to One Fine Baby Sydney on 3rd and 4th November at the Royal Hall of Industries, Moore Park. Doors open 10am – 3pm.